Taylor Hall’s first NHL game-winning overtime goal puck from 2010-11 is included in this lot of three signed Edmonton Oilers goal pucks. Hall, the No. 1 pick in the 2010 draft, has signed his puck along with a 2010 NHL Draft puck, which come with a display case that holds both pucks. Also featured are 2011 No. 1 pick Ryan Nugent-Hopkins’ signed goal puck from his 15th goal of the 2011-12 season, and Jordan Eberle’s signed goal puck from his 27th goal of the 2011-12 season. The Nugent-Hopkins and Eberle signed pucks each come with an invidual display case. 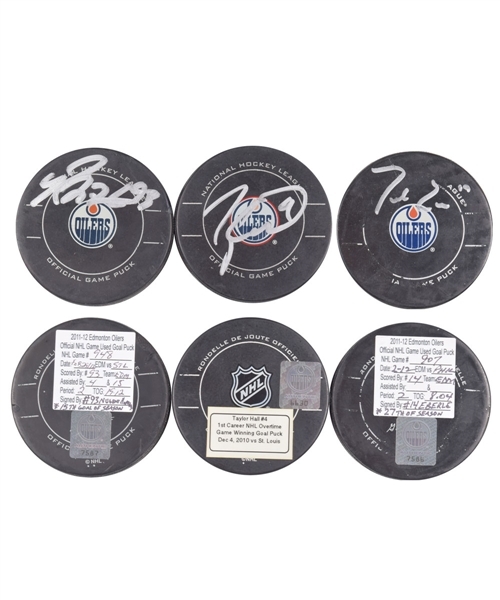 Individual LOAs signed by Oilers president Kevin Lowe are included for each of the three signed goal pucks. Hall’s signed goal puck is from his first overtime goal during his 2010-11 rookie season, his ninth goal in the NHL, scored on St. Louis goalie Jaroslav Halak 23 seconds into overtime for a 2-1 win against the Blues on December 4, 2010. Label affixed to the verso of the puck reads: “Taylor Hall #4, 1st Career NHL Overtime Goal Puck, Dec. 4, 2010 vs. St. Louis”. Oilers hologram with registry number 6630 is also affixed to the verso. Hall signed in silver paint pen through the middle of the face of the puck. Obviously light game wear includes a slice to the left of one of the NHL logos on the edge of the puck. Nugent-Hopkins signed goal puck is from his 2011-12 rookie season, his 15th goal against the St. Louis Blues on February 29, 2012. Label affixed to the verso of the puck reads: “2011-12 Edmonton Oilers Official NHL Game Used Goal Puck, NHL Game # 948, Date: Feb. 29/12, Edm vs StL, Scored by: #93, Team: Edm, Assisted by: 4 & 15, Period: 2, TOG: 19:12, Signed by: #93 Hugent-Hopkins, *15th Goal of Season.” Oilers hologram with registry number 7587 is also affixed to the verso. The puck has a chip and a few small slices on the bottom edge, and a small chip on the top edge. Nugent-Hopkins signed in thick silver paint pen along the top of the front. Eberle signed goal puck is from his 27th goal of the 2011-12 season, his 44th goal in the NHL. It was Edmonton’s second goal in a 2-0 win against Philadelphia on February 23, 2012. Label affixed to the verso of the puck reads: “2011-12 Edmonton Oilers Official NHL Game Used Goal Puck, NHL Game # 907, Date: 2-12, Edm vs Phil, Scored by: #14, Team: Edm, Assisted by: (blank), Period: 2, TOG: 8:04, Signed by: #14 Eberle, *27th of Season.” Oilers hologram with registry number 7586 is also affixed to the verso. Eberle signed in silver paint pen on the top edge of the front. A significant portion of the factory printed graphics have worn off on both sides of the puck, though the Oilers logo on the front is whole.